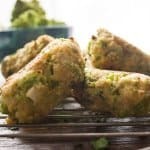 Baked Broccoli Tater Tots, a simple, healthy delicious way to get kids and adults to eat their Broccoli. Cheesy and Yummy. Since I started my life in Italy, I sometimes feel like I live in another world. Half the time, when someone talks about what is happening in North America, from entertainment to food, I have no idea what they are talking about. For example, I happened to come upon Skillet Pizza five years after it was all the rage. 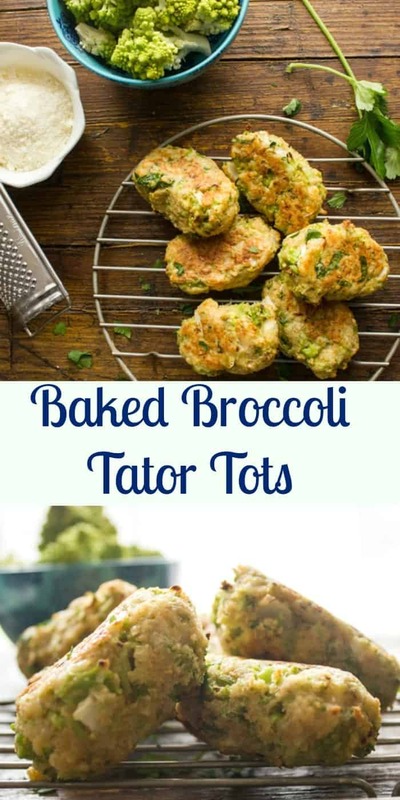 And now these cute little Baked Broccoli Tater Tots took me by surprise. I would see a lot of Potato Tater Tots, and the occasional Broccoli Tater Tots. 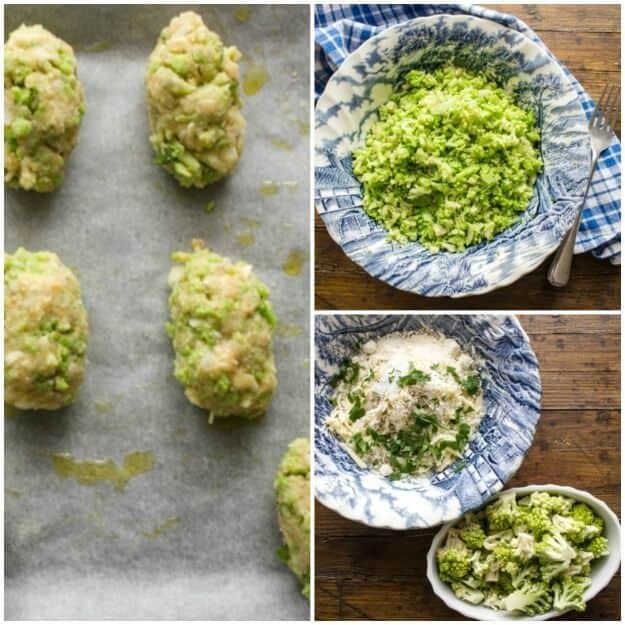 We are still up to our necks in broccoli so I thought why not give these Baked Broccoli Tater Tots a little try except with a little Italian twist. I also thought maybe after all the Valentine’s Day chocolate a healthy baked Veggie would be perfect. I mixed together two cups of fresh broccoli, with some chopped onion, fresh Italian parsley, some swiss cheese and Parmesan cheese, and a few other spices. I Placed them on a lightly oiled cookie sheet and baked them for approximately 25 minutes. They came out perfect, something so delicious and healthy is a win win right? Especially when they are so fast and easy to make. Nice and crunchy on the outside and soft on the inside. And all the Yummy melted cheese! My daughter ate two before I could even get them on the table and the Italian decided that maybe we didn’t plant enough broccoli! Buon Appetito! 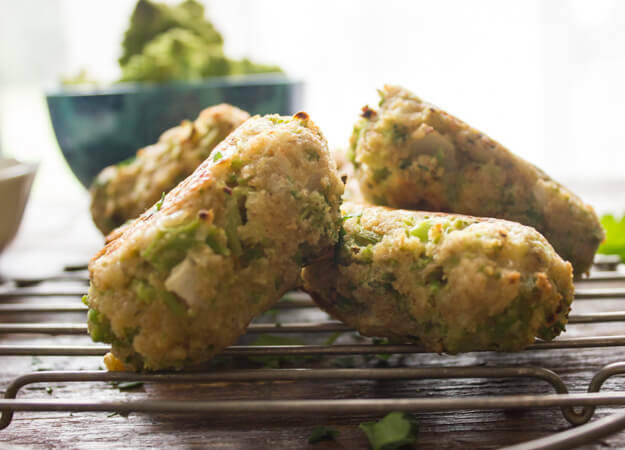 Baked Broccoli Tater Tots, fast, easy, healthy and delicious way to eat your veggies. A low carb side dish the whole family will love. Pre-heat oven to 400° (200° celsius), cover cookie sheet with parchment paper and lightly grease. Boil for only 1 minute the broccoli florets, remove from water and rinse under cold water, chop finely. In a large bowl combine, chopped broccoli, and the rest of the ingredients, gently stir with a wooden fork to combine well. Using a large spoon (soup spoon) measure out some of the mixture into your hand and shape into a log form, place on prepared cookie sheet and bake approximately 20-25 minutes, flip over after 10-12 minutes. Remove from oven and serve immediately. Enjoy! I am a vegetarian and I dont eat egg. So can you suggest me what should I replace egg with? Hi Pooja, what you could do is increase the cheese and maybe decrease the bread crumbs by a bit. Let me know how it works out. Isn’t it romanesco, not broccoli? Hi Leandra, yes you are right, it is romanesco, although we all call it broccoli, and for me really similar, some people say closer to cauliflower but I disagree. 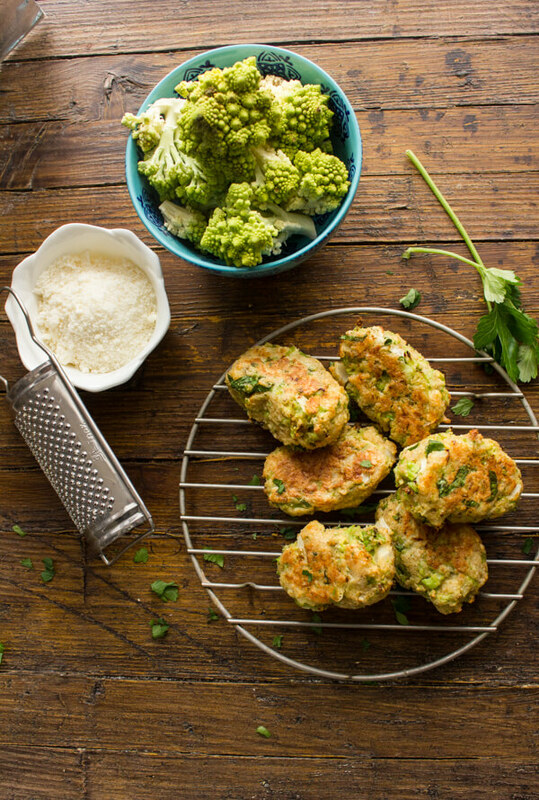 Regular broccoli works well in this recipe too. Have a great weekend. Oh to be in Italy with you 🙂 These tots look incredible. I can’t wait to give them a go with my kids! Hi Kristen, thanks hope you enjoy them. How cute!! I wish I would have had this recipe when my kids were growing up, although my kids were good about eating veggies. This is a great idea. I’ll have to make this when my kids and grandkids are visiting 😉 Have a great week. Hi Marisa, I’m sure they will like them, have a great week you too! Broccoli is really the only vegetable my grandson will eat. Since kids like everything fried (who doesn’t), I’ll definitely be making this recipe for him. Thanks for another great one. Hi Ann, haha kids, let me know what he thinks of them. Have a great week.